^ 1.0 1.1 1.2 1.3 1.4 Earnings Release FY17 Q4. Microsoft. 2017-07-20 [2017-07-20]. ^ Aaron Souppouris. Microsoft plans 7800 layoffs, $7.8 billion Nokia write-down. [2014-07-08]. ^ 3.0 3.1 Microsoft Corporation Annual Report 2005. 微軟. [2005-10-01]. （原始内容 (doc)存档于2005-10-08） （英语）. ^ Benjamin J. Romano. Microsoft head count way up in last 11 months, nearing 90,000. 西雅图时报. 2008-06-20 [2009-03-27]. （原始内容存档于2009-03-31） （英语）. ^ 7.0 7.1 Julie Bick. The Microsoft Millionaires Come of Age. 纽约时报. 2005-05-29 [2006-07-03] （英语）. ^ 8.0 8.1 Hiawatha Bray. Somehow, Usenet lumbers on. 波士頓環球報. 2005-06-13 [2008-08-18] （英语）. ^ European Commission - PRESS RELEASES - Press release - Commission concludes on Microsoft investigation, imposes conduct remedies and a fine. ^ 11.0 11.1 Information for Students: Key Events In Microsoft History (doc). Microsoft Visitor Center Student Information. [2005-10-01]. ^ 12.0 12.1 Bill Gates: A Timeline. BBC News (BBC). 2006-07-15 [2010-07-17]. ^ Staples, Betsy. Kay Nishi bridges the cultural gap. Creative Computing. 1984-08, 10 (8): 192 [2010-07-15]. ^ Dyar, Dafydd Neal. Under The Hood: Part 8. Computer Source. 2002-11-04 [2010-07-14]. （原始内容存档于2006-09-01）. ^ Jason Levitt. Is It Time Again For Microsoft And Unix?. Information Week. 2000-06-12 [2006-04-29]. （原始内容存档于2006-11-05）. ^ Dafydd Neal Dyar. Under The Hood: Part 8. Computer Source. 2002-11-04 [2006-07-04]. （原始内容存档于2006-09-01）. ^ Engines that move markets. Books.google.co.uk. 2002 [2011-05-29]. ISBN 9780471205951. ^ Microsoft to Microsoft disk operating system (MS-DOS). Smart Computing (Sandhills Publishing Company). 2002-03, 6 (3) [2008-08-18]. （原始内容存档于2004-04-05）. ^ Blaxill, Mark; Eckardt, Ralph. The Invisible Edge: Taking Your Strategy to the Next Level Using Intellectual Property. Portfolio Hardcover. 2009-03-05 [2010-07-07]. ISBN 1591842379. ^ Serial Number: 7338210. Trademark Applications and Registrations Retrieval. USPTO. [2010-08-13]. ^ The Rise and Rise of the Redmond Empire. Wired. 1998-12 [2008-01-08]. ^ 23.0 23.1 Schmelzer, Randi. McCann Thinks Local for Global Microsoft. Adweek. 2006-01-09 [2008-08-18]. ^ Microsoft Unveils a New Look. Microsoft. 2012-08 [2012-08-23]. （原始内容存档于2012-08-25）. ^ Manek Dubash. Techworld Article:OS/2 users must look elsewhere. Techworld. IDG. 2005-07-19 [2005-07-05] （英语）. ^ Microsoft Frequently Asked Questions. 微軟（Most Valued Professional）. [2008-08-18]. （原始内容存档于2008-10-27） （英语）. ^ U.S. v. Microsoft: Timeline. Wired. 2002-11-04 [2010-07-17]. ^ Microsoft Systems Journal—1986–1994 Index. Microsoft. [2008-08-18] （英语）. See May 1987 releases. ^ Thurrott, Paul. Windows Server 2003: The Road To Gold. winsupersite.com. Penton Media. 2003-01-24 [2010-07-15]. （原始内容存档于2010-06-04）. ^ Athow, Desire. Microsoft Windows 3.0 Is 20 Years Old Today!!!. ITProPortal. 2010-05-22 [2012-04-04]. ^ Miller, Michael. Windows 98 Put to the Test (OS Market Share 1993–2001). PC Magazine. Ziff Davis. 1998-08-01 [2010-07-03]. （原始内容存档于2012-10-12）. ^ McCracken, Harry. A Peek at Office Upgrade. PC World. IDG. 2000-09-13 [2006-07-04]. （原始内容存档于2009-05-06）. ^ Competitive Impact Statement : U.S. v. Microsoft Corporation. Justice.gov. [2011-05-11]. ^ Cope, Jim. New And Improved. Smart Computing (Sandhills Publishing Company). 1996-03, 4 (3) [2010-07-16]. （原始内容存档于2004-07-06）. ^ Pietrek, Matt. Windows 95 Programming Secrets (PDF). IDG. 1996年3月 [2010-07-17]. ISBN 1-56884-318-6. （原始内容 (PDF)存档于2011-05-14）. ^ Marketplace: News Archives. Marketplace. American Public Media. 1996-07-15. （原始内容存档于2004-08-23）. ^ Tilly, Chris. The History of Microsoft Windows CE. HPC:Factor. [2008-08-18]. ^ Markoff, John. Fears of Misuse of Encryption System Are Voiced. The New York Times. 2002-06-20 [2010-07-07]. ^ Stajano, Frank. Security for whom? The shifting security assumptions of pervasive computing (PDF). Software Security—Theories and Systems. Lecture notes in computer science (Springer-Verlag Berlin Heidelberg). 2003, 2609: 16–27 [2010-07-06]. ISBN 978-3-540-00708-1. doi:10.1007/3-540-36532-X_2. ^ NPD REPORTS ANNUAL 2001 U.S. INTERACTIVE ENTERTAINMENT SALES SHATTER INDUSTRY RECORD (新闻稿). Port Washington, New York: NPD Group. 2002-02-07 [2015-01-28]. （原始内容存档于2004-08-14）. ^ Conte, Natali Del. Bill Gates Announces Resignation. PC Magazine (Ziff Davis, Inc.). 2006-06-15 [2010-07-17]. ^ Fried, Ina. Microsoft launches Windows Azure. CNET. CBS Interactive. 2008-10-27 [2010-07-06]. ^ Fried, Ina. Microsoft follows Apple into the retail business. CNET. CBS Interactive. 2009年2月12日 [2010年7月17日]. ^ Gaynor, Tim. Long lines as Microsoft opens retail store. Reuters. 2009年10月22日 [2010年7月3日]. ^ Mintz, Jessica. Windows 7 operating system makes its debut. MSNBC. Associated Press. 2009年10月22日 [2012年4月4日]. ^ Steven Levy. Bill Gates on Vista and Apple's 'Lying' Ads. 2007-02-03. （原始内容存档于2007-03-31）. ^ Bill Gates. Bill Gates: Japan—Windows Digital Lifestyle Consortium. 2007-05-12. （原始内容存档于2008-05-14）. ^ 史蒂芬·辛諾夫斯基. Continuing our discussion on performance. Engineering Windows 7. Microsoft. 2008年12月15日 [2008-12-18]. ^ Windows 7 to get parallel-processing tweaks. PcTips Box. 2008-10-05 [2009-05-25]. （原始内容存档于2009-04-15）. ^ 881903.com 商業電台 - 微軟推出兩款智能手機. ^ Windows Mobile 7: A Pocket PC Central Brief. [2008-05-31]. ^ Peter Bright. Windows Phone 7 Series in the Enterprise: not all good news. 2010-03-16 [2010-11-20]. ^ Surface specsheet (PDF). Microsoft. [2012-06-18]. （原始内容 (PDF)存档于2014-10-20）. ^ Mark Sullivan. 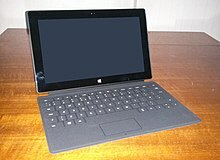 Microsoft Announces Surface Tablet PC. PCWord. 2012年6月18日. ^ 微软Surface Pro无人问津：面临国内销售尴尬. 光明网. [2013-06-16]. ^ Nick Wingfield. Microsoft Gets Nokia Units, and Leader. The New York Times. 2013-09-03 [2013-09-03] （英语）. ^ Shira Ovide. Microsoft in $7 Billion Deal for Nokia Cellphone Business. The Wall Street Journal. 2013-09-03 [2013-09-03] （英语）. ^ Tero Kuittinen. Nokia Sells Handset Business To Microsoft At A Shockingly Low Price. Forbes.com. 2013-09-02 [2013-09-03] （英语）. ^ Haydn Shaughnessy. Microsoft, Lucky Beneficiary Of Nokia's Screwed Up Strategy. Forbes.com. 2013-09-03 [2013-10-30] （英语）. ^ Peckham, Matt. Minecraft Is Now Part of Microsoft, and It Only Cost $2.5 Billion. Time. Time Inc. [2014-09-15]. ^ Bass, Dina. Microsoft to Buy Minecraft Maker Mojang for $2.5 Billion. Bloomberg. Bloomberg L.P. [2014-09-16]. ^ 74.0 74.1 74.2 硬體產品 - MICROSOFT. sites.google.com. [2018-08-02]. ^ Amanda Holpuch. Microsoft unveils Xbox One console - as it happened. the Guardian. ^ Kyle Wagner. Xbox One: Everything You Need to Know About Microsoft's New Console. Gizmodo. Gawker Media. ^ Orland, Kyle. Slimmed down 2TB Xbox One S hits stores August 2 for $399. Ars Technica (Condé Nast). 2016-07-26 [2016-07-26]. ^ Whitney, Lance. Xbox One S 500GB, 1TB bundles to launch on August 23. CNET. CBS Interactive. [2016-08-04]. ^ Warren, Tom. Xbox One X is Microsoft's next game console, arriving on November 7th for $499. The Verge. Vox Media. 2017-06-11 [2017-06-12]. ^ 孟帆. 微軟再遭歐盟9億歐元重罰. 新浪科技. 2008年2月27日 [2008-02-28]. ^ 姜燕. 商務部：微軟反壟斷調查不歸商務部負責. 新华网. 2008年8月22日. ^ 爭鳴為了自己利益 請不要支持番茄花園. 人民网. 2008年8月31日. ^ 姜伯静. 某些媒體不要用"偽數據"誤導網民. 人民网. 2008年9月3日. ^ 工商总局对微软进行反垄断询问调查 微软暂未回应. 央广网. 2016年1月6日 [2016年1月6日]. ^ Bill Gates. 微软官网. 2011年8月3日 [2013-05-18]. （原始内容存档于2013-05-11）. ^ The World's Billionaires. Forbes. ^ 94.0 94.1 The World's Billionaires 2009. Forbes. 2009年11月3日. ^ 微软公布规模最大裁员计划 集中诺基亚部门. 中国经济网. [2014-07-19]. （原始内容存档于2014-10-06）.